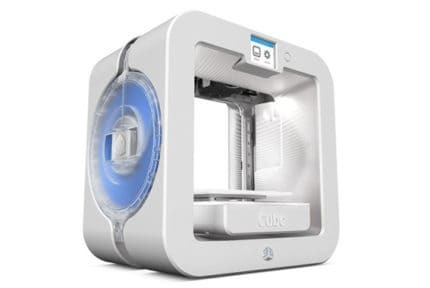 CubePro 3D Printer Review 2019 - Is This 3D Printer Worth The Money? 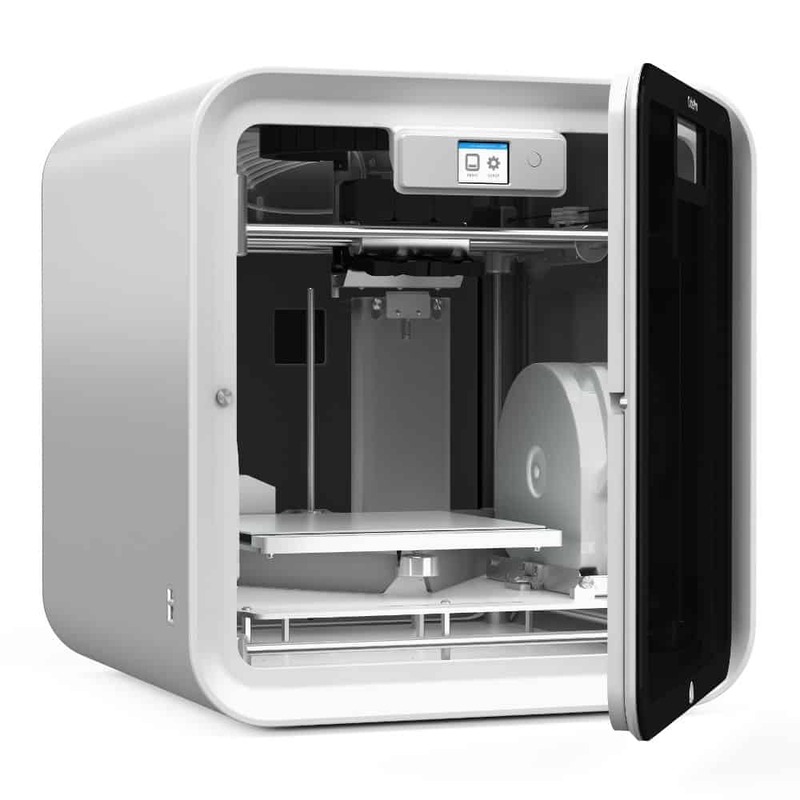 The central tenet of the CubePro 3D printer is to bring a comparatively affordable printer to the average consumer, centered on ease of use through rapid assembly and professional grade prints. Does it live up to its lofty ambitions? Let’s find out. Borrowing heavily from its namesake and smaller iteration, the Cube, the CubePro is as much a rejig as an oversized reimagining of the original. It retains the enclosed cuboid aesthetic reminiscent of a product designed by the darlings of Silicon Valley, Apple, with rounded contours, a sleek finish, and an overall look that screams professionalism. The CubePro is a perfectionist designer’s dream where every aspect of the printer has been thought out and optimized, down to details like the organized cable control systems, clean circuitry, the intelligent choice of component placement, and the overall ordered feel inside and outside of the casing. The same can be said for the hardware, which is of the highest caliber with no knock-off parts or cost saving omissions. 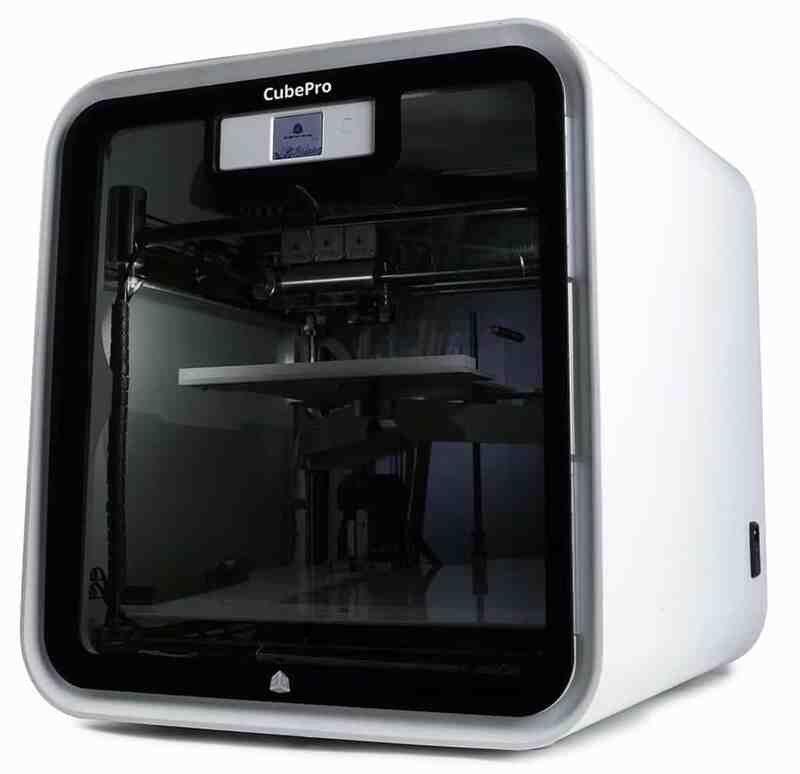 The CubePro is one large printer, weighing in at 90.7 lbs and supported by a heavy-duty, industrial grade metal frame, surrounded by an all-over acrylic enclosure with glass panels on the front and back for easy print monitoring. The top cover is removable to allow access to the inner workings of the print head for easy filament replacement and repairs if needed. 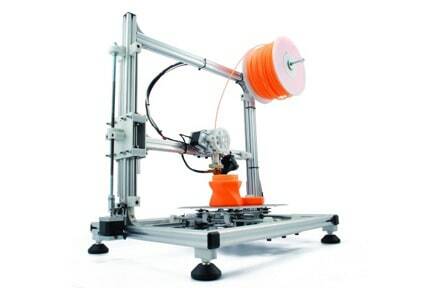 We can’t stress how sturdy this printer looks – the weight and rigid frame ooze stability. The climate chamber is sealed and heated to offer a stable environment for prints free from the effects of environmental shifts in temperature. The sealed effect is partly achieved through attention to detail in the way the front panel is lined with acoustic insulating foam to prevent heat and noise escaping. The printer is among the safest on the market and is, in theory, ideal for an educational context or home office rather than a barebones kit destined for a chipboard workbench in a dusty garage. The build area measures 285mm x 270mm x 230mm, which is ample room to print more substantial and ambitious models with ease. The build plate is a ceramic glass non-heated plate. The lack of a heated bed doesn’t matter so much due to the temperature controlled build chamber. 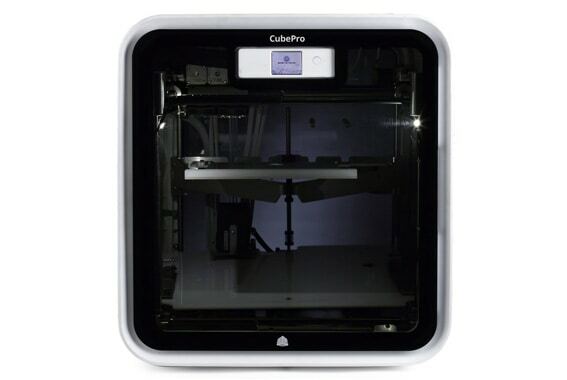 The base model includes a single extruder, while 3D Systems also offers a dual extruder and triple extruder equivalent, known as the CubePro Duo and CubePro Trio respectively. 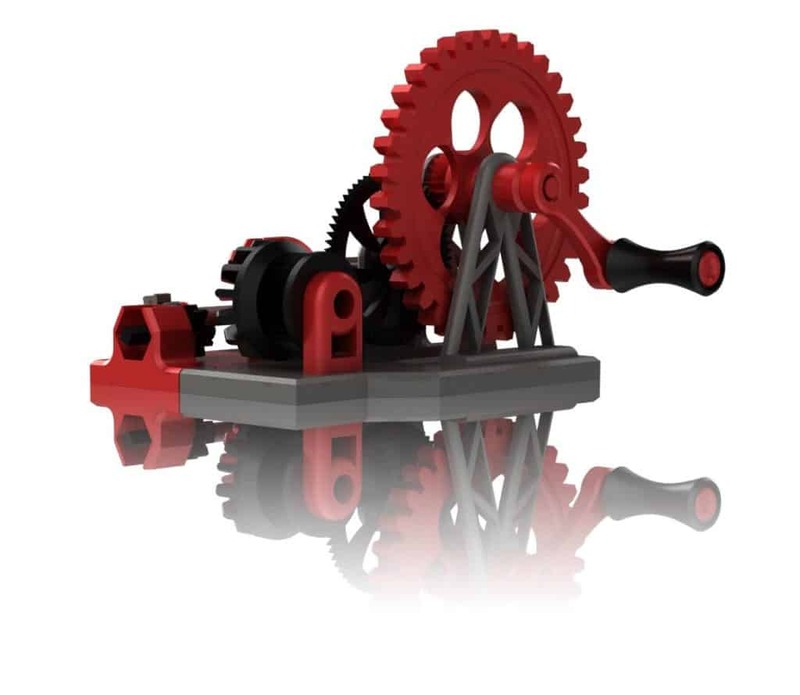 The extruder can print an incredibly thin 70 microns on the slowest high definition speed, 200 microns on standard definition, and 350 microns on fast mode. The print head runs along the X and Y axes, while the build plate moves along the Z-axis in a classic Cartesian configuration. Regarding filament options, the CubePro sticks to 3D Systems’ 1.75 mm diameter proprietary locked filament Smart Cartridge. The company offers 24 different color cartridges (Gold, Bronze, Pale Yellow, Forest Green, Coral, Navy Blue, Dark Gray, Industrial Gray, etc.) that do cost substantially more than third-party alternatives. The 3D Systems cartridges do have their benefits though as they are fitted with an embedded microchip that communicates with the printer to indicate what material and even color is being used. They are also 100% recyclable. As for what type of materials, the CubePro supports PLA, ABS, Infinity Rinse-Away support materials, and Nylon. The CubePro has USB flash drive, USB to PC, and WiFi connectivity. Control is managed through a full-color touchscreen display with a host of options from connecting to a WiFi network, naming the printer, providing detailed instructions for filament loading, cartridge status, calibrating the print plate, updating firmware and so on. 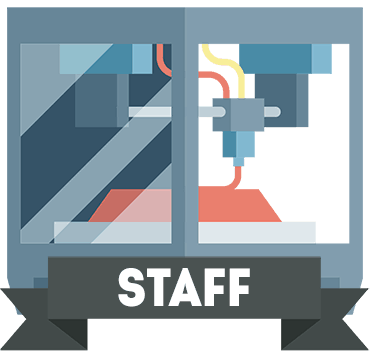 The CubePro is designed to use 3D Systems’ proprietary CubePro Print Client, which is adequate but lacks a lot of in-depth features. Print timing predictions were wildly inaccurate most of the time as well. The client is compatible with both Windows and Mac. 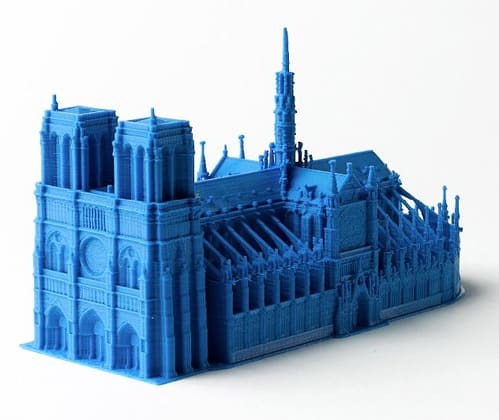 Additionally, the printer is suited to any Windows 3D compatible application such as Microsoft 3D Builder, Microsoft 3D Scan, SolidWorks 2015, Autodesk TinkerCad, Netfabb Professional, Autodesk Mesh Mixer, Siemen’s JT2Go, and Siemens Solid Edge. Although 3D Systems recommends the CubePro software, there is nevertheless some scope for users who prefer other slicing programs. As for how complicated the task of linking it to another slicer, it all comes down to the specific application. The contents of the package include the CubePro printer, ABS or PLA cartridge(s), a two-pack of Cube Glue, build plate, jet wiper, power cord, USB cord, toolkit (wire cutters, needle nose pliers, 8 mm wrench, build plate scraper, hex drivers (2.5mm, 3mm, and 4mm), T-Handle, and sandpaper), waste bin, documentation, setup guide, and USB flash drive. The printer and accessories are shipped on a pallet due to the size of the model coupled with ample styrofoam, plastic protective layers, foam tubing, and well-marked zip ties holding the movable parts together. The accessories are layered in compartments for easy removal and shipping. 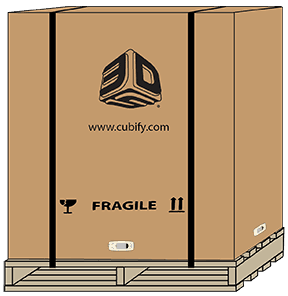 In keeping with the user-friendly, out of the box functionality ethos, the Cube Pro ships pre-assembled, although no printer truly comes fully assembled. Although nowhere as complex as other models, setting up the CubePro does take some doing. The process involves removing the protective materials, cutting the zip ties, and removing the Z-axis guard via a set of screws. The next step is attaching the waste bin for the jet wiper to the printer and then placing the build plate on the printer. From here, it’s the usual steps of plugging in the power cord and hitting the on/off button next to the touch screen. The touch screen then walks the user through connecting to WiFi, activating the warranty, and installing the filament cartridges. Filament installation is relatively straightforward and involves feeding the filament through the piping network leading to the hot end at which point the feeder gears will grab onto it. The printer does an excellent job of providing step by step instructions that are hard to get wrong, but a bit of finesse is required when feeding the filament through a sharp bend in the pipe. Once the filament is in, all that’s left is to seat the cartridge into the holding bracket, which is secure and easy to handle. The printer will then walk you through a test print. The print quality is more than decent, with the best results coming out in PLA rather than ABS. We found that the CubePro adhered to models well with attention to dimensions and reasonable detail that was nearing perfect in a lot of cases, notably simpler designs. We did encounter the odd problem with missing layers, imperfections, and varying quality levels at higher speeds. The CubePro is slow especially at 70 microns, but then again at that level of detail, we can’t be too picky. It is, however, undoubtedly a noisy device even when using the front door and top cover. Running it overnight wasn’t possible if we wanted a good night’s sleep. The noise was at odds with the home office/semi-professional feel that 3D Systems is pedaling and we were slightly disappointed. The disadvantage of a heated bed did rear its head at times, especially with ABS where the base was susceptible to some warping as the model size increased, but this remained an occasional glitch rather than a persistent problem. Glue was nevertheless required for every print with 3D Systems recommending their proprietary Cube Glue. We found it stabilized prints well and did a good job overall if allowed to dry slightly before starting a print job. More than once, we found that the filament would edge its way back into the cartridge making it impossible to get out again. The flaw is clearly in the design and puts a bitter taste to the hoops that 3D Systems asks the user to jump through with the Smart Cartridge system. Channeling MacGyver, we ended up resorting to a good old artisanal fix, which involved hacking away at the plastic casing to pry it open then feeding the filament out through the entry point. For the price of CubePro, this seemingly innocuous issue wasted considerable amounts of time and profoundly shook the printer’s foundations as a user-friendly device. 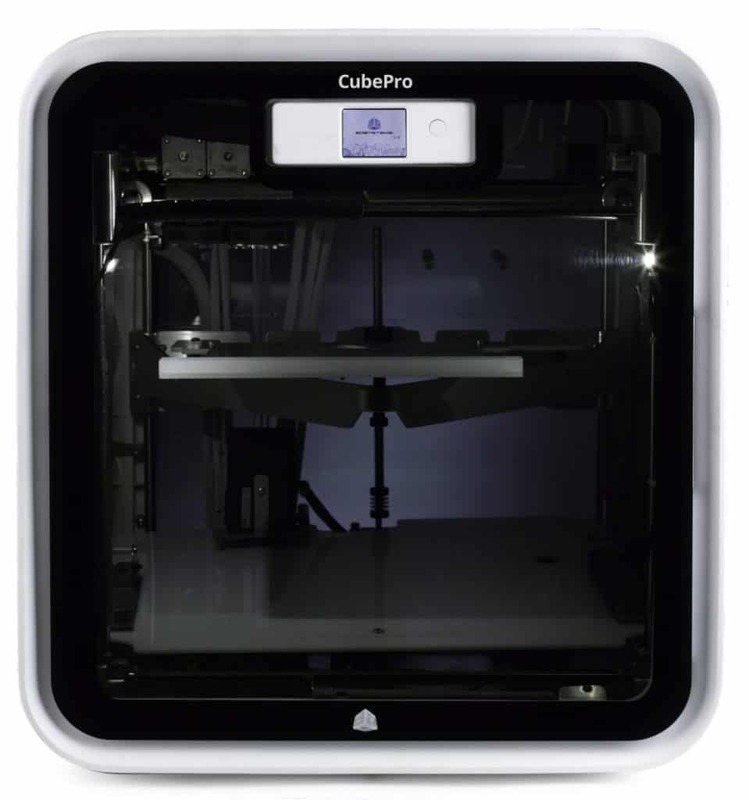 3D Systems no longer produce the CubePro, but the company’s website maintains a host of documentation and instruction manuals as well as replacement parts for purchase. Phone or email support has seized, so any questions must be directed to enthusiast forums. The warranty is a standard one-year part and workmanship, with a no refund policy attached. 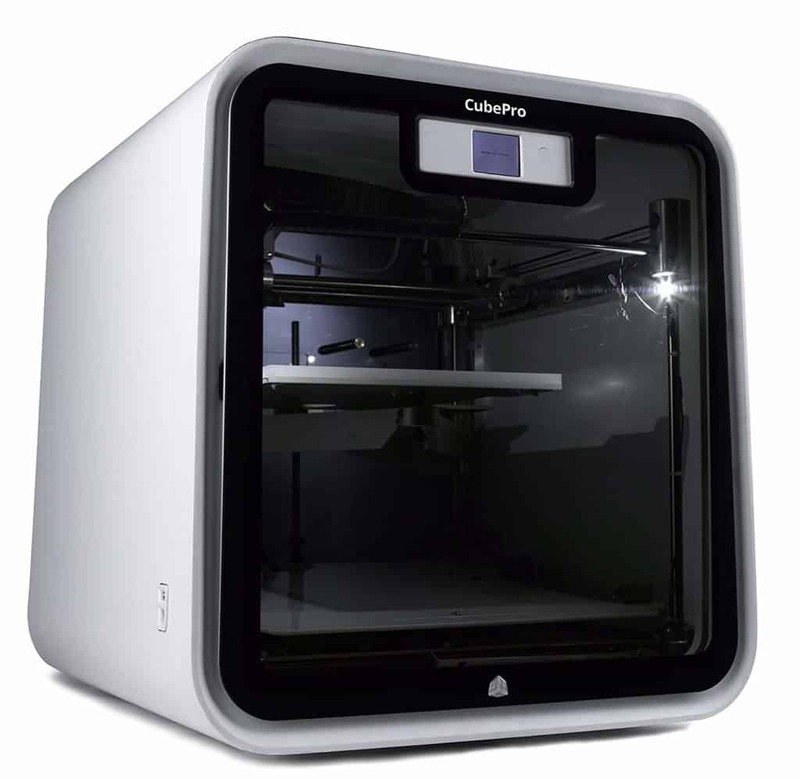 We see the CubePro as sitting halfway between printers aimed at the home hobbyist market and professional models geared towards companies for precision prototyping. In this neither-here-nor-there limbo is where we possibly find the biggest flaw of the CubePro: it is too pricey for an entry-level model and too devoid of functions to be beneficial in a professional context, stuck in a kind of no man’s land. It didn’t impress; it didn’t disappoint. It was lackluster without giving us the inspirational bug to print furiously because of the sheer joy of using the printer. We see it a perfect printer for fledgling companies that need a decent, reliable prototyping printer that isn’t as pricey as professional equivalents. A decent printer with impeccable design and more than acceptable print quality that unfortunately falls short of impressing us with anything more than what we’ve come to expect in its price range.